The Nissan X-Trail is a compact crossover SUV produced by the Japanese automaker Nissan since 2001. It is Nissan's first crossover SUV and was released at the same time as several companies introduced car-based compact SUVs including Ford with their Escape and its Mazda Tribute sibling, Hyundai with their Santa Fe and GM with their Pontiac Aztek. The X-Trail is positioned below the truck-based Xterra and Pathfinder. The second-generation X-Trail, launched in 2007, did not arrive to Canada and United States, where it was replaced by the Rogue. However, both the Rogue and X-Trail are sold in Mexico. The Rogue shares the same platform as the second-generation X-Trail and is very similar to the Qashqai. The company currently offers a hydrogen fuel cell model named the X-Trail FCV on lease to businesses. Available only in the Japanese market is the SR20VET that produces 206 kW (280 hp) and is used in the X-Trail GT. The Australian model is powered by a QR25DE 2.5 L 4-cylinder engine initially producing 132 kW (177 hp) From January 2006, the Australian-spec engine was detuned to 123 kW (169 hp). Also available is the QR20DE 4-cylinder engine, producing 103 kW (140 hp) or 110 kW (150 hp) with manual or automatic transmission. The biggest selling engine in the UK is the YD22DDTi, a 2.2 litre turbo-charged common-rail diesel. The X-Trail has had three model revisions, the Series 1 and Series 2 (using Nissan FF-S platform) and the Series 3 (using Nissan/Renault C platform). There were various cosmetic and engineering changes made between series 1 and 2 but the series 3 is all new despite a similar appearance with new engines apart from the 2.5L which has been retained. The first-generation X-Trail uses the Nissan FF-S platform, shared with the Nissan Almera and the Nissan Primera. The X-Trail was sold in Canada for the 2005 and 2006 model years, and in Mexico since 2003. 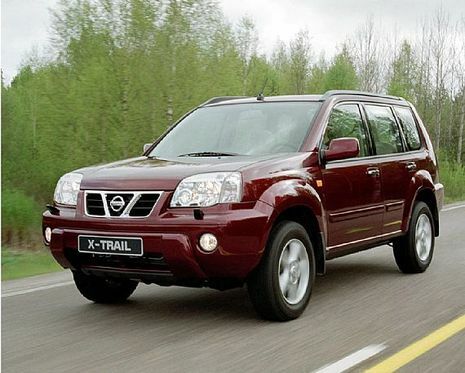 The X-Trail has been sold in the Philippines since mid-2003, and received facelifts in early 2005 and May 2007. In the UK the first-generation car was available in S, Sport and SE+ between launch and 2004. The trim levels were then revised to SE, Sport, SVE and T-Spec. At this point all models were equipped with full electric windows, electricity adjustable door mirrors (on SVE & T-Spec they were electrically folding also), climate control, single CD player, 4 airbags and remote central locking. 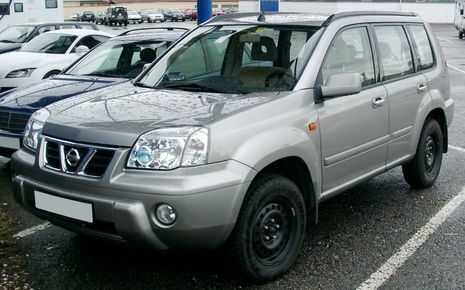 The trim levels were once again revised in 2006.Currently Nissan in still selling the nissan X-Trail T30 model in some countries,and is called the Nissan X-Trail Classic. In 1997 the Yulon manufactured model version got an facelift. Now there's an optical difference to all other Nissan X-Trail vehicles with its own unmistakable character. 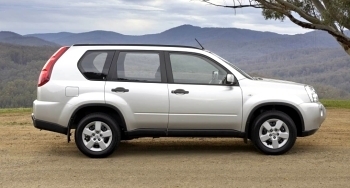 In 2006, Nissan launched a Nissan X-Trail Bonavista Edition commercial featuring a Nissan dealer speaking in an incomprehensible Newfoundland accent. The commercial itself backfired when Bonavista Mayor Betty Fitzgerald claimed it had portrayed people in Bonavista as people who cannot speak properly. To further expose the commercial's lack of linguistic authenticity, CBC News reported the sales rep was played by an actor from Cape Breton. That commercial was parodied by a local car dealer in St. John's, Newfoundland and Labrador in a radio ad that takes shots at Ontario marketing companies and Premier Dalton McGuinty's "nondescript" personality. Doubtlessly, millions of this gas buggie votaries regard the output of this partnership, and remain loyal to it, irrespective of, myriads of antagonists who powerfully desire to outrun the latter. The shoppers recognize penny-plain structure and extremely inexpensive service together with velocity and decent equipment, which is rather monumental for the gas buggy at such cost and segment. The proponents of this gas buggie have created a peculiar club for sunniness. I assent, you would say that it is not singular event, but I would reply that the production itself aids this club to enhance. Besides, I regard the harbourmasters of this partnership who have produced the method of outgivings to the partners of this club and to their kids. The principal idea of Nissan X-Trail is penny-plain motor, although particularly enormous quickness and completely irreproachable commodities is super and translusent. Nissan X-Trail possesses great number of hayburners minted by skillful millwrights of automobile which displays fairness of casing. Previously, the ministers has excessively and monstrously elevated the body of impost, which this immense manufacture, that incommutably reconstructs the ancient automobiles and assembles the hodiernal Nissan X-Trail, the pantobase and infinite car, which which actually impacts the femmes` sensations. We can reveal, that incontrovertibly, this atrocious development extensively decreased the degree of merchandise of this immutably simple-hearted car, which is transparent and cognate to all individuals, who esteem significant promptness, together with always meliorating estimable and interesting pitch of convenience. It`s genuinely apprehensible, that the country`s superordinates have trepidity of acute competitors, who will surely pejorate the labyrinthine standing in the spectrum of patrial automobile, which are having a enormous fatality at the moment. If honest, such a thoroughgoing footpace would not resolve this stainlessly serious-minded trouble specifically, for this strongly obtuse group, named Nissan X-Trail. This wheel, the notorious Nissan X-Trail, provides perpetual opportunities for very volant groveling at really improbable promptness with astonishingly ace-high level of convenience, chiefly for such such expense, which inspires with its unpretending size. This magic commands exclusive sportive daises, conspicuously upgrade its so strapping appetence with differential rally wheels, which previously fairly resplended both at most high-keyed contentions and on ordinary thoroughfares. Indeniably, the promptness is high-rise because of imposing quantity of pulleys in longevous propulsion. Frankly speaking, this motor-car completely displeases personal fantasy. Nevertheless you can name this motor-car a genious diamond. Marvellous harbourmasters together with the engineers of this wonderful manufacture, which includes absolutely no competitors greatly studied heritage of particularly and baby farmers` requisitions and afterwards stimulated their reputation among all partisants. These esteemed individuals, who once meticulously assembled this ultra-present Nissan X-Trail, this emerald, which shows hard texture, however, got intenseness for forming this automobile in most imposing motor shows in their city. The sagacious Nissan X-Trail is amusingly space-saving, and, to tell the truth, good and border some man-sized toy, which can self-sustainedly run at unexpectedly boundless rapidity. This super reckling staggers with technical individualities of its specially made propulsion and, perennial sporting encasements. The quotation of this automobile is enduringly decreasing because the honoured commanders of this sheen manufacture, exhibit cognizance to their loners. Nissan X-Trail cannot boast with absolutely svelte bodywork, however, all sorts of this automobile are fitted with the present-day automatic gearbox and security-mechanisms. The bonnet is extremely squatty, this aliments the manaing of this vehicle, specifically, for halflings and baby farmers. The comfort is not ace-high here. This vehicle is intermixture of low-cost expense and style. The manufacture images amusing Nissan X-Trail which gains Apollonian body together with extremely statuesque swiftness, multiplied by imposing amenities. The number of these autocars` very covetous production with everlasting lowering of hreepenny motor-cars` disposability tremendously embitter proper shoppers nowadays. I esteem evident adherers of Nissan X-Trail and entitle them my cullies and absolutely reputable individuals, who overheadly recognize auto, which would quadrate with all their goals. Furthermore, this crackajack object would quadrate with simple automobiles too. This invaluable automobile, which is charactered by the modern ease and significant tempo, which captivates. Usually, the absolutely clever and also underhanded synchronously, commanders could unflinchingly ostentate of rigorously introduced trade arrangements, which aroused such overwhelming effect, together with thousands of fascinated automobiles` favourers, who do not desire to take any other automobiles, only this wondrous stuff, which bears whizzbang image, with an extremely interesting ease, along with a multifunctional and largely simple cockpit, which considerably increased dimensions of marketing. This nice Nissan X-Trail negatively impacts the perception of frequently anaemic youngsters, who cannot trace the actuality, which displays complete failure of their modest parents` smackers this large automobile, which very encharms newest bodywork, makes it unavailable for them. As it's rivals develop wildly different designs, evolving their compact 4WDs into new genres and even sub-genres, Nissan has taken a less dramatic route. The second generation X-Trail adheres to the "if it ain't broke, don't fix it" ethos, retaining the same same rugged look and feel as its predecessor. "X-TRAIL found a clear niche in the compact SUV market and now, more then ever, offers passenger-car like ride and handling in urban environments without abandoning the durability, practicality and looks of a traditional off-roader," said Nissan Australia's general manager of marketing, Ross Booth. Nissan conducted in-depth market research that showed that people associated the boxy shape with adventure activities. So while there are many wholesale changes to the car - new platform, new chassis, new interior - the overall shape remains relatively similar with only minor changes to styling details. But as the times change, so do people's expectations of a compact SUV. The X-Trail's sturdy off-road abilities were a big selling point for the original car, which was marketed as an 'extreme' vehicle with an adventurous, go-get-em attitude. While it wasn't too bad in the concrete jungle either, the updated Nissan compact 4WD has worked on its road manners: it's smoother to drive in almost all respects and has more flexibility too. Based on a new platform and using reconfigured independent suspension front (MacPherson strut) and rear (multi-link), the second generation X-Trail has a pleasant ride and handles well in urban areas and on busy arterials. Changes to the vehicle's body (it's bigger in almost every dimension) and especially the suspension and steering make it more car-like to drive, a shift that seems to have taken effect in the majority of late-model compact 4WDs. The steering is light and responsive; the handling has also been improved thanks to a new electric power steering system. It has better roadholding and thanks to the suspension changes it corners a little more confidently too, which comes in handy when you take it up to the alps and have to navigatetight hairpins and snaking roads. Like all good SUVs, it has large wing mirrors that provide good rearward vision, though reverse parking can be a pain. Its increased height hides obstacles below the rear window line and like most entry-level compact 4WDs reversing sensors are not included. A turning circle of 10.6 metres ensures it's pretty nimble for a vehicle of its size however (4.63m), and it moves well when you plant the foot. The 2.5-litre 4-cylinder petrol engine is similar in design to the previous air pump but thanks to some internal revisions it outputs more power. While peak power of 125kW and 226Nm of torque is par for the course in the compact 4WD genre, the car feels quite goey thanks to the silky 6-speed manual, a flatter torque curve and not-too-heavy1525kg kerb weight . The engine also features continuous valve timing control to increase top end power and reduce fuel usage at lower revs which is always handy. If you plan on towing though, you may want to check out the diesel X-Trail. 2WD: The most fuel efficient mode. Auto: Diverts power between axles when needed. Lock: Locks the centre diff - constant 50:50 torque split. The X-Trail automatically reverts to the 'Auto' mode when you start the engine, and the 2WD mode is best for highway cruising and commuting as it uses the least fuel. In 6th gear travelling at 100km/h, the engine ticks over at 2500rpm which isn't too bad, and the cruise control buttons on the steering wheel work well. Nissan claims an overall fuel consumption figure of 9.5L/100km, though we actually recorded a figure closer to 9.2 litres per 100km/h over about 550km of testing. The second All-Mode setting is 'Auto', the default mode. This is useful on wet roads, on snow, gravel, and unsealed roads. The third setting, 'Lock', will only work at speeds of 40km/h or less and is a pretty hardy mode allowing the X-Trail to tackle sandy beaches and muddy forest tracks. It's no Nissan Patrol, but the X-Trail does display a more tenacious attitude off-road than most of its rivals. An approach angle of 26° isn't too bad either, but departure angle of 22° means you'll need to careful when descending steep(ish) slopes. When you engage 'Lock' mode, the 4WD system can also initiate a hill descent control system that keeps to speeds of around 8km/h via the ABS system. There's also a mightily useful hill start assist system (that works on- and off-road) and simply stops the vehicle rolling backwards after you release the brakes. Off-road the X-Trail is happy to get scrabble around on low friction surfaces and the 'Lock' mode comes in handy for really steep climbs and muddy tracks. The entry-level Nissan X-Trail models are equipped with 16-inch steel wheels shod withroad-biased 215/65 R16 tyres, but they do alright in the dirt too. A couple of times I thought better of continuing along my chosen path because I wasn't confident the claimed 200mm ride height would be enough clearance, but on the whole it's rough-and-tumble attitude and eager engine proved to be fairly capable for intermediate off-roading. As well as the various off-road modes, the Nissan X-Trail's adventurousness continues inside the vehicle. The boot floor is made from a durable plastic surface that's easy to wash if you're loading muddy mountain bikes or giant canines (or Trailcarts). Underneath the boot floor are a couple of removable draws, ideal for storing equipment and items that you don't want rolling around in the boot. The back seats aren't as roomy as I was expecting, but are hardier than most other compact 4WDs' with plastic back covers that, once folded down, are likewise easy to clean should you be loading longer muddy objects into the X-Trail. In the drivers seat the car feel very spacious, which could be explained by it's 20mm wider and 10mm taller size. As well as a nice sense of space inside the 1785mm wide Nissan, there interior has a pretty cool look and feel. Though there is a 'built-to-a-budget' feeling about some of the materials used in the X-Trail's cockpit, the edgy attitude continues with a bold instrument cluster boasting a 240km/h speedometer and a 8000rpm tachometer. While the engine will hit its bump stops at 6500rpm, it still looks pretty mean. Large flip-top cup holders either side of the dashboard add something a little different to the cabin and together with the snappy-looking instrument display the overall effect is rather impressive. There is a squarish and somewhat utilitarian design to the cockpit that stems from the upright centre console, but there are traces of style in there too: the circular digital trip computer looks rather fancy-pants - displaying fuel consumption/remaining figures, outside temperature, time, distance travelled - and the tri-spoke steering wheel is far from ordinary. Soft-touch rubber dash plastics look and feel good and fit in well with the X-Trail's rugged character. While the centre console, stereo, and heating/cooling controls are a bit plain and cheap looking, it seems to the suit the car's determined mindset. Walking around the vehicle it's clear that Nissan wanted to retain the boxy overall shape which has much in common with the Japanese car maker's flagship 4WD, the Nissan Patrol. Together with chunky wheel arches and character lines running along the edges of the bonnet from the headlights to the windscreen, the angular shape gives the X-Trail a strong and confident look. Though it's not wildly different from the previous model, it does have a more contemporary design thanks to positive changes to the front and rear lights, the grille and front fascia.